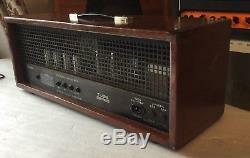 Up for sale Super Rare vintage Red Bear MK 60 Lead Tube Guitar Amplifier Head Made in Russia for Gibson 60w 6L6. Amp in very good condition, working ok. Runs 110 volt AC, AMERICAN EXPORT AMP. The amplifier is built from the same soviet military electronic parts as the sovtek mig amplifiers but it has many differences and the sound character is individual. The red bear line of amplifiers was the creation of russian amplifier designer, sergei novikov. Novikov at the time was known as one of the major tube amplifier experts in eastern europe, russia and all of the former soviet union. Red bear amplifiers were designed to offer exceptional tonal response from a sweet, clear, clean sound to bone crushing, heavy-metal distortion. They were truly professional amplifiers that were built to deliver years of musical satisfaction and outstanding performance. Each red bear amplifier was hand made by the skilled workers at novik, ltd. Red bear amplifiers were a joint collabortaion between novik, ltd. And the gibson guitar corporation, nashville, tennessee. Red bear amplifiers use a very simple and straight forward apporoach to the control layout. They are some of the best sounding tube amplifiers ever created and are, especially when comparing them to the tube amplifiers on the market today, very low-cost, an excellent combination. Sadly, the red bear line was eventually dropped by gibson, and in the us, redbear amps, like their owners, are relatively few in number. The redbear amplification website was started in early 1999 in an effort to bring together red bear users. It was created after experiencing first hand the true quality of these amplifiers. It was also my goal to create the best source of information on such great amps because of the lack of other resources on the internet. For over 10 years, this site was the product of many redbear user contributions and the work of several great people, and i extend my many thanks to those who have contributed and to those who have helped me with this site. In 2011, in my wish to update the site as a valuable information resource, i have decided to make full use of the available technologies on the web and move most of the content to facebook. This truly puts the redbear amplification site in the hands of the community, the vision i originally had for the site back in the 90s. This has allowed me to make this free site easier to maintain both financially and regularly, as well as reach and connect even more people in their love for these amps. The item "SUPER RARE RED BEAR VINTAGE TUBE GUITAR AMPLIFIER HEAD FOR GIPSON MADE USA EXPOR" is in sale since Thursday, May 31, 2018. This item is in the category "Musical Instruments & Gear\Guitars & Basses\Guitar Amplifiers". The seller is "polivoks-global" and is located in Saratov. This item can be shipped worldwide.